I'm sure you are here because you are tired of being skinny and after reading this post you will have the information you need to gain weight and build muscle fast. As an ectomorph the first thing you will need to do to gain weight and build muscle fast is you have to eat more calories than your body burns off. If you don't give your body MORE calories than you need, it simply will not grow and you will not build any new muscle. Now that you understand you have to EAT and EAT as if it was a job. But I dont want you to eat just anything you can get your hands on you need to eat the right amount of macro-nutrients for the body to build muscle! Now, carbohydrates have got a bad wrap for the past decade and for good reason but this principle does not apply for ectomorphs! Carbohydrates are your best friend. But what you must understand is not all carbohydrates are created equally. There are two types of carbohydrates. Carbs can be classified as being either fast or slow digesting carbohydrates. Fast digesting carbs, such as white rice, white bread, cookies, candy, sugar, dextrose, etc. are broken down quickly by the body. After you eat fast digesting carbs your body breaks it down into energy to be used by the body which in this case is pure glucose "sugar". This energy is then released into your blood stream. Fast digesting carbs forces the body to produce and secrete a fat storing hormone called insulin. This spike in insulin is produced so that this energy (glucose) can be moved from your blood stream to the cells of your body where it is needed. If you're body does not need this energy or if it is not later burned off thru activity it is stored as fat in your fat cells. However, if fast digesting carbs are eaten at the right times such as directly after your workout the insulin spike can fuel your muscles with the nutrients it needs to build muscle and accelerate muscle recovery. As ectomorphs, building muscle is difficult so you will need to take advantage of every opportunity you can to build muscle and enhance recovery, so you can train again sooner. Complex carbohydrates on the other hand, are harder for the body to breakdown. They give us a slower release of glucose into the blood stream when broken down and don't spike insulin levels in the body. This slow release of carbohydrates is good for building muscle, because you are continuously supplying the body with the nutrients it needs to keep your body in an anabolic muscle building state. Unlike most of the world who seem to be running away from carbohydrates, you will need to consume large quantities in order to meet your required calorie intake. Remember, you are trying to bulk. You need to eat eat and eat. You have to take in more calories than your body requires to maintain itself. Stick to complex carbs such as nuts, beans, brown rice, brown pasta, whole wheat breads, yams, sweet potatoes, fruit and vegetables. However these foods have a high amounts of fiber which will keep you full longer and cause you to eat less. If you find that this is a problem for you and it causes you not to eat as much as you need to then its ok to mix in fast digesting carbs such as white bread, white rice and white potatoes. It is also important to eat lots of fresh fruit and veg. Fruits and vegetables are essentially carbohydrates so add them to your total. They also provide anti-oxidants to speed up recovery after workouts and to keep you fit and healthy. Your exact intake of carbs will depend on your bodyweight but as a rule of thumb, take your bodyweight and eat between 3 and 3.5 grams of carbs per lb of bodyweight. Remember that carbohydrates contain 4 calories per gram. Some days its ok to add in a day of super high carbohydrates just to keep your body guessing so it doesn't adapt to your new eating regime. 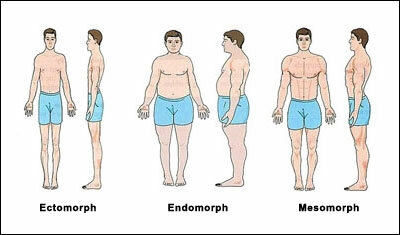 Again this type of eating is for the true ectomorph and not for mesomorph's or endomorph's. These body types will add a lot of fat to their frames!! Protein is quite simply your most important macro-nutrient. Protein is the building block for the body. It is very important for bodybuilders who are looking to build muscle fast. My advice is to choose lean sources of protein. It not healthy to get high saturated fats in your diet and this form of fat comes from all meats. Turkey, chicken, fish, lean steak and eggs, all nuts, beans and of course, protein shakes are all good sources of proteins. Aim to cram down around 1.5g of protein per lbs of bodyweight. Fats are often overlooked in the muscle building nutrition for ectomorphs. Fats play a very important role in the body such as they lubricate cells within the body but the most important role for ectomorphs, is that they regulate TESTOSTERONE LEVELS! Without testosterone you BECOME A WOMAN. TESTOSTERONE IS WHAT SEPARATES MEN FROM WOMEN WHEN IT COMES TO BUILDING MUSCLE. What you must know is first that fats like carbohydrates are not all created equal. Food high in saturated fat needs to be avoided at all costs as they clog arteries, increase cholesterol and increase your risk of heart related problems. The fats you are looking for are high in omega 3, omega 6, and omega 9. Excellent examples are oily fish, avocados, flaxseed, all nuts or eggs. A mixture of all of these would be the best way to add these fats to your diet. To our bulking advantage, fats have 9 calories per 1g which is excellent for us ectomorphs! 160lb X 17 = 2720 calories per day for a bulk. Broken down roughly into 340g of Carbohydrates, 204g of Protein and 51g of Fat. These figures will depends on you activity level has is not an exact science but it is definitely a great place to start. If after a week you have gained no weight increase your daily intake of calories by 600. 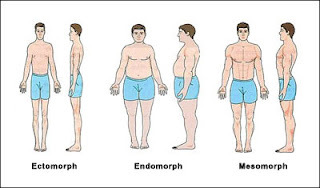 Below are links to a sample list of foods to be included in your Ectomorph diet. Remember, you need to EAT to grow big. I recommend you write down everything you eat. Many times you may think you are eating more than you really are!!! Calculating everything can be difficult at first especially when eating out but visiting http://nutritiondata.self.com/ this website will help you figure out how many calories you are getting per meal including its individual macro nutrient components.